We believe in playing our part to help clients reduce waste, conserve energy and create sustainable buildings. 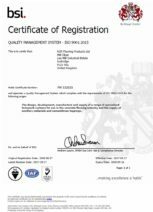 As part of the RCR Industrial Flooring group we are committed to operating at the highest quality, environmental and health & safety standards relevant to the country of manufacture. 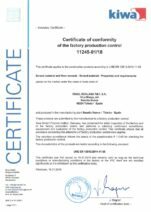 In Spain our manufacturing plant holds both ISO 9001 and ISO 14001 – and indeed was the first company in the world to be accredited to the new ISO 9001:2015 standard. 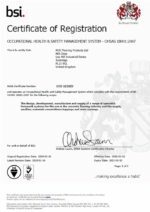 Our UK manufacturing plant holds ISO 9001:2015 quality management registration, ISO 14001:2015 registration for environmental management and OHSAS 18001:2007 health & safety management accreditation. It also holds the Investors in People Health & Wellbeing Award. 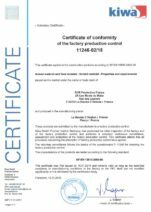 Our French manufacturing facility also holds ISO 9001:2015. Several of our products (including our dry-shake surface hardeners) hold LEED certification, testament to their environmental credentials. All RCR products comply with the Construction Products Regulation (Regulation (EU) No. 305/2011), and hold appropriate CE marking.